You know what a ledger is right? A big accounting of debits and credits. A running list. Can I tell you something? I'm really bad about keeping a ledger of rights and wrongs in my head. And it's a problem. I keep up with things I've done to people. I keep up with things people have done to me. I keep up with things I've done for people. It's not really a part of my day to day life. I don't walk up to people and immediate bring up my ledger for them. But, it's there in the back of my head. And it usually goes hand in hand with gossip, anger and hurt. If I'm gossiping about someone the little Aimee in my head goes to her filing cabinet (I imagine my brain as a filing cabinet) and pulls that person's ledger. If someone makes me mad or hurts my feelers, little Aimee in my head retrieves their ledgers. It works against me too. When I mess up, little Aimee in my head pulls out my own ledger of stupid things I've done in the past. 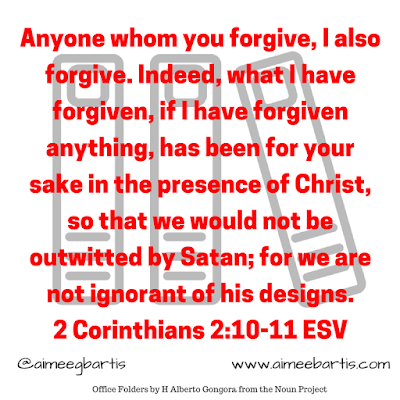 Paul is forgiving the Corinthians for the sake of Christ. So that they may receive Paul's teachings and come to know Christ better. But, it's that last verse that really got me thinking. so that we would not be outwitted by Satan, for we are not ignorant of his designs. 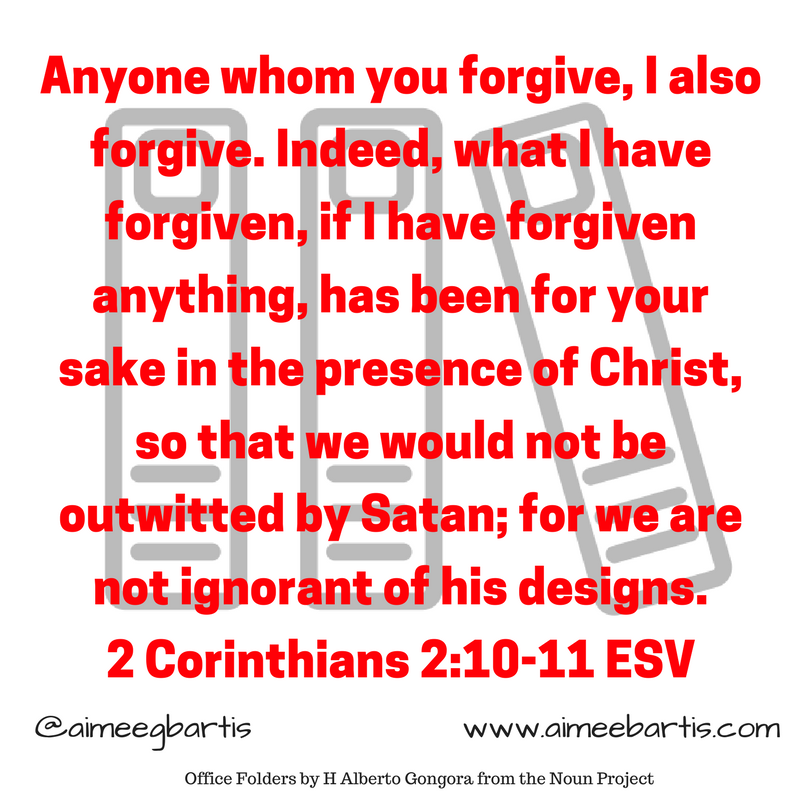 When we don't forgive, we set ourselves up to be outwitted by Satan. That is not okay with me. I want Satan as far from me as possible and I certainly don't want to be outwitted by anyone. So, I'm asking God to forgive me first off for keeping my ledgers (and the gossiping it's a terrible habit). 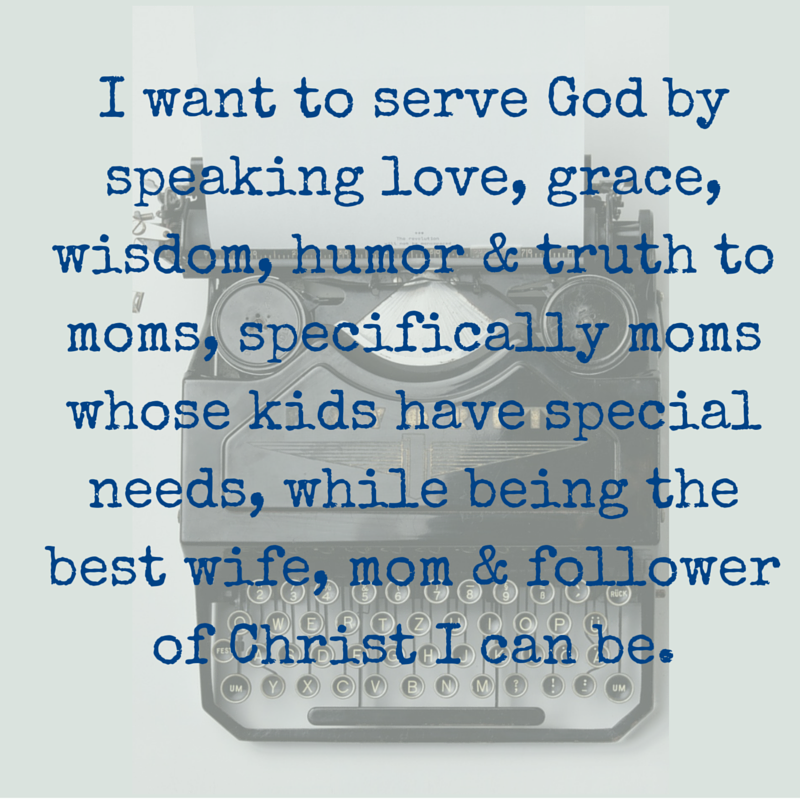 I'm asking him to help me be more like Paul - forgiving - towards others and myself. We all grew up hearing "forgive and forget". That is so hard. And I don't buy it. I don't want to forget the people who wrong me because I don't want to be wronged again. I think a better saying would be "forgive and give grace". I want to forgive those who've hurt me and I want to offer them the same grace Christ offers me - the grace of a fresh start. Here's to a fresh start, free of ledgers!